The omnibus privacy bill (S. 155) the ACLU-VT has been pushing for three years crossed the finish line in the last 12 hours of the final day of the 2016 Vermont legislative session. It was a big win for Vermonters' privacy, and we appreciate the work legislators in the two judiciary committee put into its review and passage. 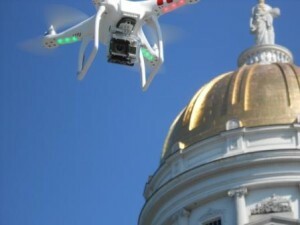 It's the first broad privacy protection bill ever passed by the Vermont legislature. It aims specifically at privacy threats created by new digital technologies. New warrant protections will be in place for law enforcement use of drones. Access to the state's massive (8 million plate "reads") automated license place recognition (ALPR) database is restricted. How the privacy of electronic communications such as e-mails and Web searches will be protected is spelled out; police use of "stingray" devices is expressly forbidden. Only in the e-medical records privacy portion of the bill did the legislature's work fall short. Legislators accepted the health care industry's view that there is no e-medical records privacy problem that isn't already being addressed and that adding a private right of action when breaches occur is unjustified and potentially a major financial headache for doctors, hospitals, and related medical services providers. We believe that's inaccurate. Vermont's e-medical records system has weak front-end protections that necessitate the creation of back-end deterrents to discourage abuse. Duffort v. Vermont Agency of Education, et. al.